I cannot begin to tell you how happy Grotbags was to receive the new Barbie™ In Princess Power DVD, she has been poorly all week and this really made her day. The DVD comes with a free Barbie™ facemask which you can decorate to create your own super sparkle mask enabling your child to play at having super powers too, just like Kara. Grotbags found the DVD funny in parts and I could hear her chuckling away whilst I was preparing dinner, her favourite bit was when Kara fell in to the tree and ended up dangling by her feet. Wouldn't it be great to have a superpower, Grotbags said she would like to care for all animals and make them better. This is another fabulous film with an encouraging message to children "that it's a lot better to work together than alone" . To celebrate the release of the brand new hero adventure Barbie™ In Princess Power, we have 2 copies to give away on DVD. 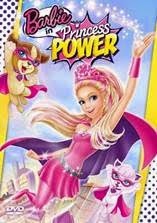 Don’t miss this brand new hero adventure, Barbie™ In Princess Power, available on DVD, and DIGITAL DOWNLOAD from 16th February 2015. To be in with a chance of winning Barbie™ In Princess Power on DVD, just answer the following question and complete the rafflecopter form. B- Butterfly - my 6 year old Katie just loves Barbie and the films and we actually love watching the films as a family. We haven't seen this one yet and would so love to watch it and add it to her ever growing Barbie DVD collection. Thanks for the chance.